Firstly, print out the templates, stick them onto card and cut out. It is advisable to draw the angel onto the plywood (using the template as help) so that you can fit as many onto the wood as possible. The stars can be drawn onto the remnants. If there are several angels and stars drawn onto the plywood, they should be sawn out in advance otherwise it could lead to complications during the youth club session. You should request the youth club attendees to wear old clothes because of the sawdust. Additionally, ensure you go through the safety precautions with the youth club attendees in advance. At each workstation clamp a piece of wood to the table to act as a work-surface, thus ensuring that the children do not cut into the table. Begin with the arduous task of sawing out the wooden angel and the wings – remain patient for this as it can be very time consuming! Following this, sawing out the stars is quickly done. Then sand down all the edges; this should always be done diagonally from the top down to prevent fraying of the wood. It is advisable to cover the work surfaces with news paper to avoid paint marks. Before painting, first use a pencil to demarcate the areas between different colours, going over the lines with black felt tip pen. I advise you to paint one colour at a time, leaving each to dry so as to avoid the colours bleeding into one another. Don’t forget the corners and the back. Now stick the wings to the back of the angel, stick the wool on as hair and draw on a face. Place the ribbon around the neck, sticking the ribbon ends to the star. 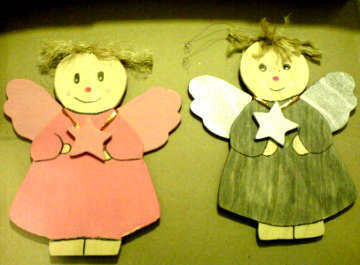 Finally, attach string to hang the angel up and the wooden angel is finished! The rectangular angel body should be drawn onto the wood and sawn out using the (electric) saw. 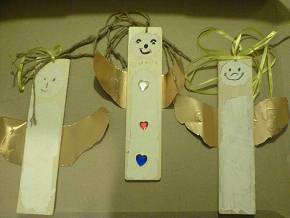 Firstly the children should paint the angel bodies. Whilst the paint is drying, cut out the wings. Following this the wings, hair and beads for decorating are stuck on. 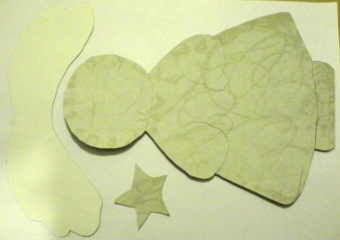 To finish, draw on the face and attach the string to hang the angel up.